Green Mountain is located in the Lick Creek Range, a subrange of the Salmon River Mountains of central Idaho. Green Mountain is found between Rapid Creek and the North Fork of Kennally Creek. A 4WD rig with good clearance can get you to almost within a mile of the summit. So it is a short cross-country hike to a nice summit with some great views. With just a couple hours to work with, I was looking for a short hike near Donnelly, and Green Mountain looked like a nice option. Splattski was nice enough to join me for his second time up this peak. We met at Paddy Flat Road, then made the drive almost to Kennally Creek campground, before turning up road 391, which we followed all the way to its end. In hindsight, it may have been just as easy to walk the last mile of road instead of navigating the numerous water bars along the way. From the end of the road, we headed northeast up a faint ridge that was partially recovering burn area. This area was impacted by the 2015 "Rapid Fire". It was easy going and we made a leisurely wander up to the summit ridge and then a quick traverse over to the highpoint. From there, Splattski regaled me with his knowledge of the surrounding peaks, and was able to identify pretty much everything we could see. The summit afforded some great views with a pretty short hike, and it felt good to be standing on a sunny summit in November. After enjoying the scenery for a while, we took a little more scenic route back to the trailhead. Round trip was about 2.5 miles and 1300’ gain in just under 90 minutes. A nice little adventure. 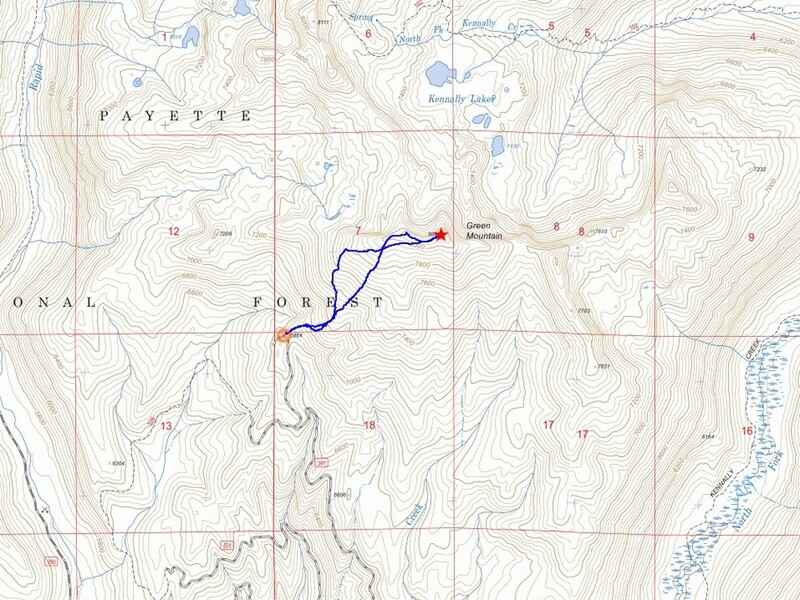 Map of our route, about 2.5 miles and 1300' elevation gain round trip. Burn area, early in the hike. Nearing the summit of Green Mountain. Square Top and the Needles to the east. Rapid and Buckhorn to the north. Jughandle and Boulder to the west.